It's not often I get a chance to play around with new versions of Windows Server before they're released, but after finally spotting that Technical Preview 2 had been released, I thought I'd check it out several months before the RTM version is released. Server 2008 was a massive change compared to Server 2003, but mostly in a good way (on the downside, system requirements were a lot higher). Problems with graphics drivers no longer resulted in a BSOD, just a restart of the desktop windows manager; IPv6 support was good; the firewall was significantly better with the ability to filter traffic in and out of the host. The difference between Server 2008 and 2008 R2 was mostly making it user friendly, with windows snapping to the side of the screen, fewer UAC prompts, and much better TLS support. The difference between 2008 R2 and Server 2012 seemed fairly minor, assuming you didn't give "MinShell" a try. The main changes were improvements to Hyper-V, but you can also swap your traditional Windows software RAID setup for Storage Spaces (e.g. 3 way mirror to support the loss of 2 out of 5 drives). You also get network features like NIC teaming, DHCP Guard and Router Guard. But many places already have things like an iSCSI SAN, network cards with software to perform NIC teaming, and might not need these new features; but being able to do more things natively can't be a bad thing (although I'm still not sold on Storage Spaces, it seems to have a very large overhead and poor performance). The most obvious change in 2012 R2 was the welcome return of the Start Menu, but there were new features like Work Folders, Desired State Configuration, Storage Tiering, as well as significant improvements to Hyper-V. Having only run 2012 R2 as a virtual machine in Microsoft's Azure cloud, I've only really spotted the difference in the Start Menu. Windows Server 2016 was always going to be more than just a bit of spit and polish that improves the user experience. I decided to go for the "with local admin tools" option as I wasn't feeling brave enough to try a new version of Windows having to use remote management tools (what seems to be equivalent to "Server Core" in previous versions of Windows Server). I didn't realise this meant "MinShell", a very minimal GUI, with no sign of the Start Menu. This provides you with Server Manager, but a lot of things you click on will result in either the Command Prompt or a PowerShell window appearing. Most of these provide a text based interface, where you select a number or letter to choose an option, drilling down to what you need. Occasionally you'll choose something and see a Windows dialog box pop up (which is quite annoying). In many ways this seems like a backwards step. It'll be interesting to see if they replace a lot of the menus and alerts with more PowerShell, and whether the Command Prompt that appears on login will be switched to PowerShell by default. This looks like an attractive and user friendly GUI, similar to Windows 10 but without the tiles. This will be nice for SMEs that like having a GUI to administer their handful of servers, but Enterprise clients will probably appreciate the MinShell and Core equivalents due to their lower system requirements and reduced surface area for attackers to compromise. Still easier than working out how to use the DAB radio in my car. Also, Radio Nirvana misleadingly titled (not constantly playing Nirvana)! Caught up on GoT so I'm finally back on Twitter. But I'm seriously considering not watching it anymore. They've done it again. A little while ago I started watching Community on Amazon's Instant Video. 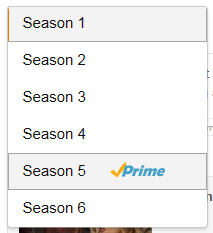 I'm only 7 episodes into the show and now I can only watch Season 5 for free using my Prime subscription. Seriously Amazon, WTF?!? First you stop me watching Extant halfway through (I notice that Extant is now available again), then you stop me watching Perception, and now Community!? I'm not going to jump into season 5 of a show, that would be crazy! It's bad enough that I'm not entirely sure how I can legally watch the sixth season in the UK (understandably, Yahoo Screen won't let me watch it from the UK), but that's a problem to solve in about 90 episodes' time. How on earth is anyone supposed to get into a show and watch the episodes back to back if you keep messing around your Prime customers? You're practically forcing us to buy every episode so we can start and/or continue to watch the show. If I wanted to pay for every episode I wouldn't pay for a Prime subscription in the first place (I'm usually happy with free delivery, and if I ever need next day delivery it's probably cheaper to pay for that than pay for Prime). At least I can watch Community on Netflix.